Unfortunately, due to construction impacts from our expansion project, the Primula Sale will be suspended for 2019, but is planned to return in 2020. 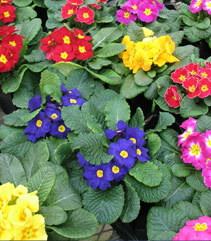 Capture the first signs of spring with a colorful and classic primula at the Primula Sale at Olbrich Botanical Gardens. Take home a rainbow of primroses in striking purple, red, yellow, orange, and pink, all grown from seed in Olbrich's greenhouses. These primulas are hardy and will bloom year after year in your garden. Often one of the first flowers to bloom in spring, some primulas also bloom again in the fall when the weather becomes cool. Primulas are cool weather perennials that do best when planted in the ground. They make wonderful gifts, so purchase them for your friends and yourself! Olbrich's primulas are grown in fiber pots instead of hard plastic pots. The fiber pots are "compostable, not plantable," meaning that the primulas must be taken out of the pot and planted in the ground or a container. Then the fiber pot can be added to your compost bin. All proceeds from the sale benefit the Gardens.